It’s no secret that Dr. Jessica Emery loves technology and everything that goes along with it, including photography, social media, and professional networking. These are just a few fun aspects of technology’s recent developments! You may have noticed that Sugar Fix Dental Loft has a slight bias toward Apple products, and that’s because Dr. Emery absolutely loves not only their incredible devices, but also their top-notch customer service and technical support. 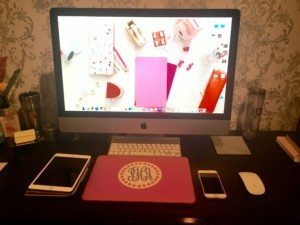 Today’s blog highlights all things Apple that you’ll find in use at the Loft! We have several Apple products to help us get creative throughout the day! Almost two years ago, Dr. Emery knocked down some walls between her then-smaller practice and the neighboring salon, thus expanding Sugar Fix! This allowed her to mold an ideal creative space where she and her team could unwind throughout the day, while feeding Dr. Emery’s second passion- the social side! With the expansion came the purchase of several Apple devices; the Old Orchard store should definitely know Dr. Emery by name at this point! One of our favorite items from the Apple line is the iMac, and SFDL owns two of these beauties! One is specifically to allow Dr. Emery’s creative imagination to run wild in her (rare) free-time spent in her personal office. The other iMac has found a home in Paxton’s office. Paxton is the newest Sugar Fix team member, and she enjoys helping Dr. Emery with her innovative endeavors (including Dental Soirée– coming soon)! We love using the iMacs in our office because they are super user-friendly and make editing photos and videos a breeze! 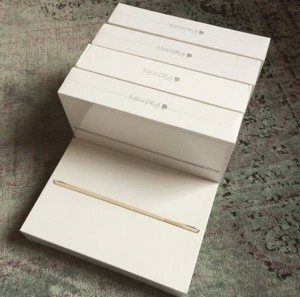 Each Sugar Fix employee has an iPad to use at continuing education courses and team meetings! Unwind by taking advantage of our Apple TV during your next visit! 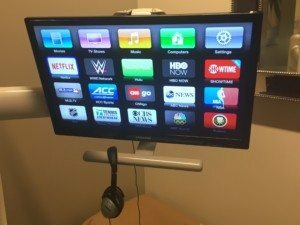 Our wonderful guests, also, get to experience one of Apple’s greatest creations during their dental visits- Apple TV! Who wouldn’t want to escape the all-too-familiar sounds of the dental office by throwing on our Bose noise-cancelling headphones and getting lost in a show on Netflix?? Even Dr. Emery and the Sugar Fix team love taking advantage of this amenity during our own dental procedures! Dr. Emery loves her iPhone and, of course, her “tickled pink” Kate Spade case! Last, but certainly not least, Dr. Emery is a huge advocate for iPhone– not to mention her adoration for her Kate Spade case (check out her video review)! On a typical day at the Loft, you’ll find Dr. Emery using her iPhone to keep our social media content live and fresh! She has recently taken to Snapchat to share the inside scoop into her day-to-day life! Be sure to follow us (as if you aren’t already) on Facebook, Twitter, Instagram, and Snapchat (@DrJessicaEmery) to see what’s up at Sugar Fix! We hope you enjoyed today’s blog! Please comment below and tell us your favorite Apple device!